In 1820, three years after her death, Jane Austen’s publisher remaindered all copies of her books. She sunk into obscurity “out of print, out of demand, and almost out of mind.” Today, of course, Austen is a worldwide phenomenon. Claire Harman offers an engrossing account of the erratic and somewhat inexorable rise of Austen’s popularity in Jane’s Fame: How Jane Austen Conquered the World. Harman flavors her narrative with diverting bits of trivia, for example Rudyard Kipling was a fervent Janeite! He considered Austen’s gravesite at Winchester Cathedral to be the second holiest place in England after Shakespeare’s hometown of Stratford. Harman begins with a look at Jane the author. In particular, I was fascinated to learn that Austen devised a proto cut-and-paste approach to revision by pinning small paper cutouts with new wording over sections of a working draft. Austen struggled, however, to get her works published. Ultimately she sold both Sense and Sensibility and Pride and Prejudice at somewhat bargain rates just to see them in print. The success of these books allowed her to get a better deal for Mansfield Park, which financially was her most successful work, earning her £30 a year. Emma, however, sold the most copies on its initial run. Tragically, it was just as Austen was gaining success and recognition—albeit anonymously as her works were published by “a Lady”—that she died. Her tombstone made no mention of her as an author. An 1816 first edition of Emma. During the nearly 13 years her books were out of print, copies were treasured and traded by a niche of faithful readers, including several luminaries of the literary world. Sir Walter Scott had the full set and read Pride and Prejudice at least three times. Other admirers included Robert Southey, Maria Edgeworth, Benjamin Disreali, Lord Tennyson, and Samuel Taylor Coleridge—but not William Wordsworth because, according to Coleridge’s daughter, he had no sense of humor. Both English and pirated translations of Austen’s novels were read in France, Russia, Sweden, Switzerland, and even in America. I was gobsmacked to learn that James Fenimore Cooper’s first novel was actually a reworking of Persuasion titled Precaution, which flopped. In 1833, Austen’s books were reissued as part of low-cost series, Standard Novels, sort of the Penguin Classics of the day. These editions began to sell steadily, gaining steam as the Victorian age took hold. Interest in Austen the author also grew steadily, erupting by the 1870s into the cult of the “Divine Jane.” Noted literary critic Leslie Stephen, father of Virginia Woolf, lampooned this as “Austenolatry”—a riff on “Bardolatry” the cult of Shakespeare. Not long after, another critic named George Saintsbury coined the term “Janeite,” still so popular today. At Winchester Cathedral, so many visitors turned up looking for Austen that her nephew and biographer James Edward Austen-Leigh erected a memorial plaque. During World War I, Austen’s novels were a favorite among British soldiers and were well stocked in the trenches. They were also prescribed reading material to the wounded for their soothing and “salubrious” effects. By the 1920s, a “Janeite cabal” ran the Royal Society of Literature which would brook no criticism of the author. Beyond these hallowed halls, Austen had also exploded into the mainstream, via magazine articles, compilations, decorative special editions, and Austenalia: sequels and continuations of her novels. There was also a clamor for her letters, juvenilia, portraits, and any other related memorabilia, all of which were unearthed and published. Jane had her share of detractors, though. Ralph Waldo Emerson had found her to be without genius or wit—a startling and somewhat paradoxical appraisal, but then he was rather severe. Surprisingly, Henry James felt she was overrated. Mark Twain’s derision of Austen has long been celebrated by her detractors, but what I didn’t know is that Twain repeatedly tried to read her works. Still, Austen continued to gather fans: W.H. Auden, G.K. Chesterton, E.M. Forster, Katherine Mansfield, Rebecca West, and even the crotchety Winston Churchill. Another unlikely candidate, Aldous Huxley, wrote the screenplay for the first film adaption of Pride and Prejudice in 1940. Memorial tablet honoring Jane Austen at Winchester Cathedral. There are so many other delicious tidbits, as Harman takes us through different film adaptations and pop-culture trends to the current online zeitgeist of fansites and blogs. But I don’t want to give away the too much of the book, which I highly recommend. Throughout, Harman manages to keep Jane very much in the present with anecdotes, family memories, quotes, and a clever musings as to how Austen would react to all this. Indeed, we all wonder and that’s part of what drives our Janeite mania. Even after reading her novels, her letters, various biographies, and, yes, many of the Austenalia takeoffs—we still thirst for more of Jane Austen. 8:15 am ish Books down for now. Feeling rejuvenated by my classics read-in, though I did not make it 24 hours. Still, as the forecast is freezing rain today, I’m hoping to channel the #ccreadathon with more Wharton this afternoon. 7:17 am Picked up Jane Austen, Game Theorist by Michael Suk-Young Chwe to reread the sections about Mansfield Park. I’m not sure if this counts (pub’d in 2012), but he has some new and very interesting insights into the character of Fanny. Resisted the urge to go online, so as to maximize last hour of #ccreadathon time. 11ish pm Fell asleep reading Edith Wharton. Barely remember flicking off the light. 8:30 pm Finished MP and now completely absorbed by The New York Stories of Edith Wharton. Reading about Old New York is almost like time travel. 6:55 pm Got slightly sidetracked looking at all the fun readathon updates at #ccreadathon and @ourclassicsclub on twitter. Back on the couch and nearly finished with Mansfield Park! 1:45 pm Took a break to walk the dog during the sunniest part of the day. The cold, hardened snowscape has me thinking I should be reading Ethan Frome, but I’m most content with Mansfield Park. 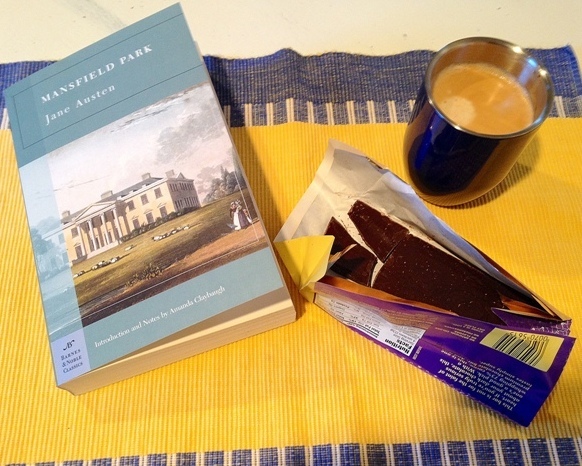 9:51 am Looked up from Mansfield Park to peruse #ccreadathon and @ourclassicsclub on twitter. Lots of great ideas for my target classics list. 8:17 am Ah, coffee and Jane Austen … I should start every weekend morning like this! 7:58 am Gasp. Rolled over to realize I’d slept in! Grabbed Mansfield Park off nightstand and flipped on the coffee. Coffee, chocolate, and a classic. 2.) Snacks/Beverages of Choice: My readathon fuel will be Nespresso coffee (yes, pods, but so unbelievably delish! ), Lady Grey Tea, and dark chocolate. 3.) Where are you reading from today? Frozen, snowbound Connecticut. It’s 14°F outside! Perfect day to spend reading. 4.) What books are you planning on reading? Am starting with Mansfield Park by Jane Austen. 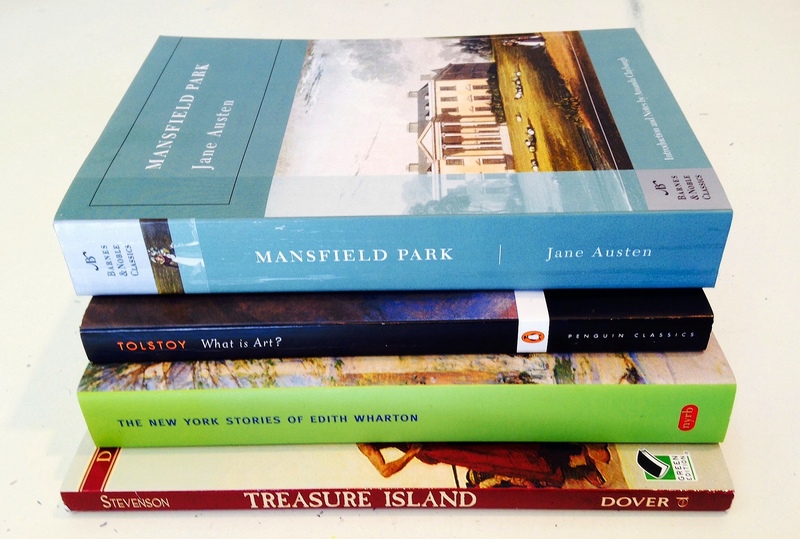 Also on deck: Treasure Island by Robert Louis Stevenson, The New York Stories of Edith Wharton, and What is Art? by Leo Tolstoy. Here’s a bit more on my book choices. 5.) Are you excited? Yes! Well, inversely. I am excited to do nothing exciting but relax and read. I love that “this is a laid back, zero pressure readathon.” I always enjoy the @ourclassicsclub tweets about the Classics Spin and other classics memes. One of my New Year’s resolutions is to get involved! The 2nd Annual Classics Club Readathon takes place Sat. Jan 4th. What better way to start the New Year than by reading classic literature?! Indeed, a cosy day of tea and classics will be most therapeutic before we all get back to reality on Monday. Read my Intro Post and Readathon Progress Updates. The 24-hour readathon kicks off at 8 am EST. Sign up and join us!! I have four books at the ready in my readathon pile, although I most certainly won’t get through all of them. I do not like to rush when I’m reading, especially not when I am reading classics. Classic literature is to be savored. I’ve selected two novels and two collections of shorter writings. Check out my readathon progress. Mansfield Park by Jane Austen is top of my hit list. This year marks the 200th anniversary of MP, so I am very excited to get into the celebratory spirit. This will be the fifth or sixth time I have read “my least favorite” Jane Austen novel. Still, it’s by Jane Austen, so it is of course a standout among books. Treasure Island by Robert Louis Stevenson— I think adventure on the high seas will be a nice offset to Fanny’s quiet world, though I suppose it would pair better with Persuasion and Captain Wentworth. Both Treasure Island and Mansfield Park are bildungsroman (coming-of-age) novels, so they work well together in that sense. The New York Stories of Edith Wharton—I love Edith Wharton’s writing, and I was happy to discover this collection of her stories about Old New York society. I always find it fascinating to read her descriptions of the city, as many of her landmarks are still there. What is Art by Leo Tolstoy—The Russian master theorizes on “the role of the artist,” in this collection of essays on art, culture, and society. Tolstoy also details his visits to the opera and other contemporary happenings. I made sure to secure Penguin Classic edition, translated by the award-winning duo: Richard Pevear and Larissa Volokhonsky.